Track your nutritional and physical fitness with AFIT! 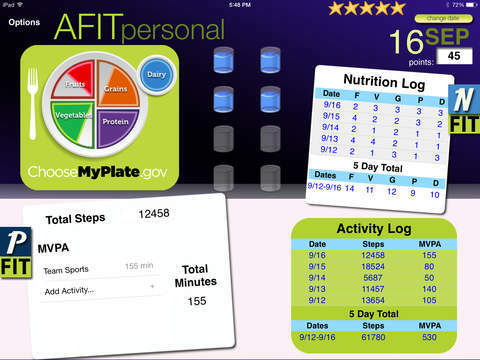 AFIT is a tool to help you learn about nutrition and physical activity as you track your progress each day. The main components are based on a motivational strategy for engagement in a healthy lifestyle. Anyone can use AFIT to monitor health information as an AFITstudent. You get points and stars as you enter what you eat and what activities you accomplish, starting fresh each day. You get an overview of your progress with the nutrition and activity logs, and you can jump back to review and edit your information for any day in full detail. If you are participating educational study, you can log in to submit your information to your AFIT Pro teacher or group leader. AFIT helps you learn about the U.S. Department of Agriculture’s MyPlate guidelines for Fruits, Vegetables, Grains, Proteins, and Dairy. Tap any of the food groups to see a list of foods. Tap the food you consumed, and watch your plate fill up! AFIT promotes two types of physical activity. Track Moderate to Vigorous Physical Activity (MVPA) by selecting the activity type and number of minutes. If you track your steps with a pedometer, you can enter how many steps you took at school and elsewhere in the day. At the top of the screen, you can see your points and stars. Points are awarded for each food item you consume towards your Recommended Daily Intake (RDI). You get additional points and stars by achieving your RDI in each food category, drinking 8 glasses of water, and logging activity. Your points are endless, and you can earn up to 10 stars each day. Both nutrition and activity logs give you an up-to-date 5 day total. This allows you to see personal trends in your habits and work toward your goals. Turn on an alert that reminds you to track your health at the same time each day.